Dr. Murtagh was the first “Keeper” of the National Register of Historic Places, the Nation’s register of national, state and local properties nominated by the states and federal agencies and recognized by the National Park Service as significant historic properties. Born and educated in Pennsylvania, Dr. Murtagh received his undergraduate and graduate degrees from the University of Pennsylvania. Fascinated by the architecture of Pennsylvania, he became a Fulbright scholar and studied the origins of the Pennsylvania Dutch barns. This led him to become the Director of the Kemmerer Museum and Historic Bethlehem, PA. From there, he was hired by the National Trust for Historic Preservation where he took part in a committee that produced “A report on Principles and Guideines for Historic Preservation in the United States” in 1964. This report laid out the underlying principles that became the basis of the National Register after the passage of the Historic Preservation Act in 1966. 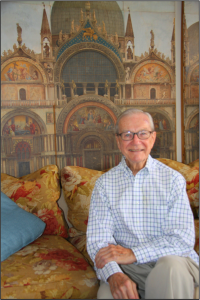 Dr. Murtagh is a singular figure in US historic preservation due to his immense influence on how we recognize, evaluate and preserve historic properties. He is charming, inclusive and visionary.